Check it out on Goodreads. Lemon grew up with Stella, a single mom who wasn’t exactly maternal. Stella always had a drink in her hand and a new boyfriend every few months, and when things got out of hand, she would whisk Lemon off to a new town for a fresh beginning. Now, just as they are moving yet again, Lemon discovers that she is pregnant from a reckless encounter—with a guy Stella had been flirting with. On the verge of revisiting her mother’s mistakes, Lemon struggles to cope with the idea of herself as a young unmarried mother, as well as the fact that she’s never met her own father. Determined to have at least one big adventure before she has the baby, Lemon sets off on a cross-country road trip, intending not only to meet her father, but to figure out who she wants to be. This book was vivid, encompassing, beautiful, elegant, dreamlike, lively; all the best adjectives that I can think of listing. Colorful prose and messy characters led to the most interesting combination of elements that I haven’t seen since Dreamland Social Club. Fingerprints of You took brave risks. The pregnancy didn’t define Lemon, which is a big trend in similar YA books. She defined herself and the pregnancy changed her. It made her look at her past and present but wasn’t the only part of who she was. So many books make it about the pregnancy or the child or the father – only the trials of being pregnant – but Lemon had other issues to work through too. She was mixed up and that had a lot of impact. All the other parts of her life didn’t stop just because of her pregnancy. Lemon was such a real and beautiful character. She was messy and dreamlike. She was soft and not too much of any one quality, exactly the way that real people are. She was multidimensional and multifaceted; uncertain and confident, strong but messy in navigating through her choices. She was a quiet strong. I’ve discussed on this blog before how some characters are seen as strong in a stereotypical sense while other, more determined characters miss the label because of weaker circumstances. She lived a lot of her life in her head but wasn’t afraid to take risks. Lemon was a type of character that I’d like to be like – she was fascinating but still relatable. This book was an equal balance of looking through to a wobbly future and wading through a murky past. It was all about uncertainty. Was it better to forge ahead with no idea of what could happen or stick to comforts and pray for the best? Stella was real. Yes, she had flaws. She wasn’t necessarily a great mom or a bad mom but her choices were what they were. She did the best for Lemon and did what she could – she was erratic and quirky but also stubborn. The description makes it seem like Stella was the flighty sort of mom often discussed in books like this, but she was a lot more than that. It was a great balance of the unpredictable, unreliable mom portrayed in books with the more realistic cast of a woman who did the best she could with what she had and still managed to care for her daughter in the process. As Lemon changed, Stella changed, and that was really rewarding to see as the book continued. I could definitely see the traits from Lemon to Stella and Lemon and Stella’s relationship was almost like a foil to Lemon and her future child’s. Lemon defined a lot of who she was by other things, but the pregnancy did a lot for her. She started to see more worth in herself and be confident because of the experiences that she had growing up in the same circumstances. She was a true person who breathed off the page and had life stitched into her very pores. She was different but not in an exaggerated way. My best description of her would be realistic, lively, and subtle. I have a thing for road trip books. It combines wanderlust and the weird type of bonding that only happens when you travel. Lemon made a few choices that weren’t the best and set off for the unknown – it was risky. It was a plot device that’s often used (Saving June, Amy & Roger’s Epic Detour) but Kristen Paige-Madonia still spun it in a way that was fresh and new. Emmy was such a fantastic supporting character – all of them were. Aiden and Ryan and Dylan. They were all such characters – they rounded out the story perfectly but they weren’t exaggerated but had their own flaws and weird talents and habits and everything that made them so relatable. It made the entire cast so dysfunctional and they all impacted each other throughout the book. The character development in this book definitely deserves a round of applause. It was really realistic but I was still in for so many surprises. Everything happened seamlessly, weaving together in a way that just made me think “this book is perfect” with every flip of the page. I was shocked by some details, annoyed with some behavior, crying and laughing and experiencing a whole spectrum of emotion with Lemon. It was heartfelt and dramatic but never exaggerated or fake. 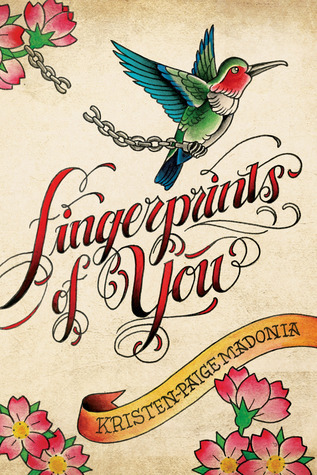 Kristen Paige-Madonia really has such an excellent TALENT of fleshing out the little details that make it so unbelievably realistic but her gorgeous writing and unforgettable characters make it a story worth falling in love with. The details aren’t plucked randomly; they’re precisely the descriptions that make it completely absorbing. Definitely a writer I want to keep my eye on. This was a review that I actually wrote a few months after I read the book, because I felt like I needed time to truly digest what it did for me. I still remember everything about that book and how it made me feel. I remember putting it down for the last time, reading certain lines and not being able to breathe for a moment. Alluring and refreshing, honest and sweet. Sharp descriptions and soft characters made for a beautiful read that will stay with me for a very long time. It’s emotional but not overwhelming; it’s a complete masterpiece. No book club questions at the moment. Hey y’all! I’ve been dealing with some health issues this semester, and took the month of February off from content creation. I’m hoping to be back soon, but for now, I’m on a temporary hiatus. Thanks for your patience! HAPPY ANNIVERSARY, WORDS LIKE SILVER! For all the latest news in YA books, publishing, and other bookish pursuits, subscribe! You'll get an email with every post on Words Like Silver. I accept ARCs, finished copies, and audiobooks. I am currently not accepting self-published review copies due to scheduling restraints. If you would like me to review a book or schedule an interview/guest post, please email me at wordslikesilverblog at gmail dot com after first reading my review policy. Thank you! If you see any picture of yours on this blog that you're not comfortable with me posting, please email me! I'm happy to take it down or give credit to you. Most of my pictures are from Goodreads or had no credit to, so it's difficult to always keep track of photographers! If you use a picture off my blog, please email me first just so I know. Thank you! Copyright © 2019. Design goodness from Squeesome!